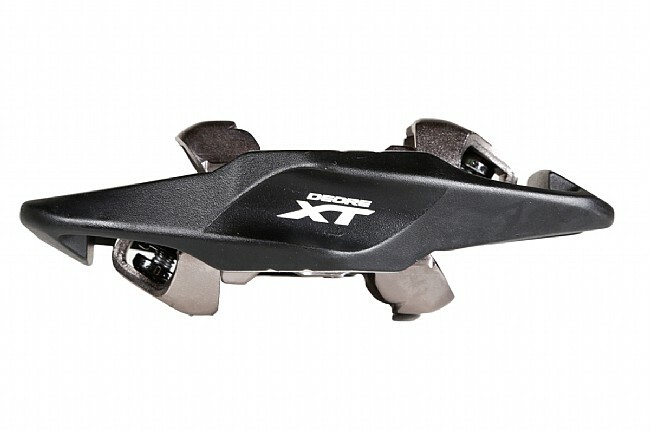 New for 2016 is the latest version of the venerable XT Trail clipless pedals. With everything you love about the legendary XT clipless pedals, Shimano's XT PD-M8020 Trail pedals add a larger platform for confidence and stability for trail and enduro. The platform gives an 11.7% increase in pedal-to-shoe contact. The larger aluminum body has ample space for shedding mud. Spring tension is adjustable. And as with all Shimano pedals, these are built to last a very, very long time. Compatible with Shimano SPD cleats. 4 deg float. Chro-moly. 2 year manufacturer warranty. Great pedals for all uses. I've been a touring cyclist for years and have used a variety of spd pedals. These XT's offer a large platform and dual-sided entry, making them perfect for long days in the saddle without getting numb feet, combined with the most convenient clipping in-and-out you can imagine. I like them a lot better than the Shimano road spd pedals I had that had one-sided entry. Bought these to get rid of the hot spot under my cleats from smaller spd cleats. No more hot spot and seems to have better power transfer. I really like these pedals on my mountain bike - I can start on hills without clipping-in until I am ready. Usually my foot finds the clip position within a crank or two and I am off. Bad thing - you really need to get the correct shoe clips for mountain biking. I tried the regular SPD clips and my feet would not come out of the clips fast enough - even at the loose setting. I crashed twice around steep corners where I could not get my feet out fast enough. 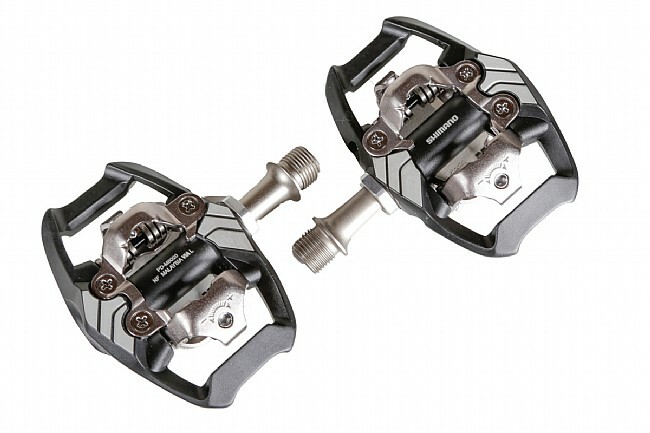 If you buy these pedals - Get the SH56 SPD cleat with an M stamp. These cleats will allow a much easier unclip when needed. Have not had a problem since I purchased the SH56 cleats. These pedals are light and provide a great supportive base for your feet on long rides. I especially like the double-sided feature of these pedals. No problems getting in or out of these. I'm a road rider so can't review for dirt. Pedals are easy to adjust and use. just what I wanted in a mtb and cx pedal. I've ridden SPDs for mtb as well as cyclocross racing for years and recently switched to the SPDs with the a larger platform and happy that I did. There's just a little more feel you get with the added surface area vs. normal SPDs. Also very nice to be able to ride with regular shoes when called for without slipping off. The XT versions are very smooth and can be rebuilt when necessary, a great buy!